Does smoking cost as much as it makes for the Treasury? Do taxes on cigarettes bring in enough revenue to cover what smoking costs the government? We know they bring in about £12 billion in direct tax revenues, although that doesn't count other contributions of the tobacco industry to total tax take (for instance income tax paid by employees). And the cost side of this equation is even trickier to pin down. Estimates suggest costs anywhere between £3 billion and £6 billion for NHS treatments in a given year. In the longer term the total cost might be lower, since some of those who die prematurely due to smoking might otherwise have gone on to cost the service even more money due to other health conditions. NHS treatment isn't the only cost to the government, which spends money on things like sweeping up cigarette butts and putting out fires caused by cigarettes. It also loses tax revenue from lost productivity when people are made ill by smoking. The cost of treating smokers in England was estimated at £2.7 billion in 2006. That was made up of £1.2 billion spent on hospital treatment, £600 million on consultations with GPs and practice nurses, and £900 million on GP prescriptions. That £2.7 billion would be worth about £3.2 billion today (adjusting using GDP deflators). Other research put it as high as £5.2 billion in 2005/06 (about £6.2 billion today). These studies suggest a range of between £3 and £6 billion costs to the NHS, but there's too much uncertainty in the estimates to rely on these bounds or place a more precise estimate between them. None of this comes close to telling us what the NHS spends on smokers on top of what it would spend if they didn't smoke. Imagine a patient in her 40s who is diagnosed with terminal cancer as a result of her smoking. Let's say her care costs the NHS £20,000 before she passes away. Now imagine we could go back in time and prevent her from taking up smoking in the first place. She might live into her 80s, and even if she spends that time in relatively good health is likely to require any number of GP consultations and routine prescriptions in that time. If her treatment over these decades costs any more than £20,000 then actually the NHS would have spent less had she been a smoker. This is just an example and isn't meant to reflect a typical case, although some research has suggested non-smokers have greater healthcare costs over time. It also takes a very narrow view of costs—there would also be economic costs to her premature death, which we deal with in the following section, as well as the very substantial personal cost to her and loved ones of her lost years of life and the suffering that comes with lung cancer. While smoking has a direct impact on the NHS, it can also be said to have an indirect impact on society more widely (for instance, fire services need to be called out to incidents caused by smoking and ill health can result in lost productivity at work). The think tank Policy Exchange made an attempt in 2010 at quantifying the wider costs, coming up with a £14 billion total (including the £2.7 billion estimate of NHS costs). This is even more uncertain an estimate since it's based on estimating lost economic output from workers dying early from smoking-related conditions (£4 billion) and even taking smoking breaks at work (£2.9 billion). That assumption has been criticised on the basis that it assumes smokers take more breaks than other workers. As in the case of NHS costs, the net effect on the public purse might be smaller in the longer term. People dying earlier can reduce the state's spending on social care and pensions. So the 'real' costs of smoking can go some way beyond admissions to hospital alone, although it's a mammoth task to put a number on this. So is the Treasury clawing the money back? Smokers will be all too familiar with the price of cigarettes, but perhaps not with how much of it is actually tax. 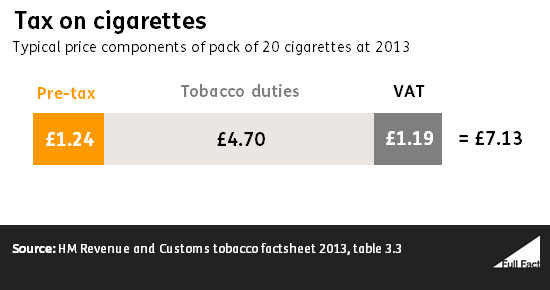 The typical price of a pack of 20 cigarettes was £7.13 in 2013, according to HM Revenue and Customs (HMRC). Of this, a full £5.89 was tax, including tobacco duty and VAT. So 83% of the price of a pack went back to the Treasury. Hand-rolling tobacco is less burdened by tax (71% goes to the Treasury) and cigars even less so (48%). The government takes in a total of about £9.5 billion in tobacco duties, and the Tobacco Manufacturers' Association has told us another £2.5 billion goes to the Treasury in VAT. So the Treasury is taking in about £12 billion directly from tobacco sales. Even here, you could argue indirect benefits such as taxes from people employed in the tobacco industry and the contribution of tobacco sales to the economy as a whole could add to the Treasury's take. Again, that's where we go beyond the realm of fact and into very complicated and uncertain estimates. This article replaces a previous version, published in November 2013, and includes the latest figures and other research we've been pointed to.